Our registered patents prove our technical leadership. By 2010 Kaneka had been awarded 185 domestic patents in Japan and 254 internationally. Kenji Yamamoto, chief executive of the Kaneka Corp.
research and development headquarters won a prize for the 17th photovoltaic generation international conference. The award ceremony was held in the meeting place of "the 17th photovoltaic generation international conference" (PVSEC-17) in Fukuoka-city / Fukuoka convention center. This photovoltaic generation international conference prize was conferred on the person who contributed to development of the technology of photovoltaic generation greatly in Asia Pacific district. The winner was elected by recommendation of the photovoltaic generation international conference Organizing Committee. Kaneka solartech Corp. won a prize for eco-friendly entrepreneur 2007, Hyogo. This prize was given from Hyogo prefecture especially for a company presenting good environmental safeguard / creation activity. Their various activity such as doing lecture about production of the solar battery and environmental contribution, recycling of the industrial waste, receiving of plant tour, registration to the environment sightseeing course to make new lifestyle of Hyogo people were admired, the award ceremony was held in Hyogo diplomatic establishments. 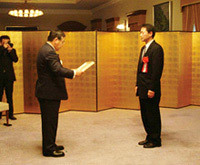 Kaneka won a prize for Osaka excellent invention 2006. This prize was given from Japan Institute of Invention and Innovation osaka branch office, admired the manufacturing method of the silicon thin-film based photoelectric conversion device. This prize had been given every year since 1976 to the people in Osaka prefecture who contributed to development of the technology of Japan.